At the core of yantra functions is something known as "shape energy" / "form energy". The concept is that every shape releases a particular frequency and energy pattern. Examples of earlier beliefs in energies from shapes are the mandalas in eastern philosophies, the Star of David, the five pointed star (pentagon), the Christian cross, and the pyramids and so on. Specific 'powers' are attributed to the numerous shapes. Some have 'evil' or destructive energies and some 'good' or constructive energy, but in YANTRA Yoga only the benefic as well as harmonious energies are used. When one concentrates on a yantra, his mind is habitually "tuned in" by RESONANCE into the particular form energy from that yantra. The method of RESONANCE is then preserved and improved. The yantra acts only as a "tune in" apparatus or a doorway. The subtle energy doesn't come from the yantra, but from the UNIVERSE. Fundamentally yantras are keys for creating RESONANCE with the energies of the MACROCOSM. 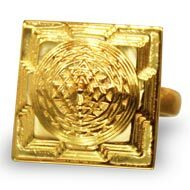 Often the yantras puts us in contact with extremely elevated energies and entities, being of priceless help on the spiritual path. The Yantra offers a source that is a path into the absolute. When our mind is focused on a single object (Yantra), the mental ambiguity ceases. Ultimately, the object is released when the concentration can remain empty and silent. In most advanced phases, it is possible to reach union with God by the geometric conception of a Yantra. The Yantra is considered to be a microcosmic representation of the macrocosm. It is a cenre point and an outer / inner doorway. They are often fixated on a particular deity and so by tuning into the diverse Yantras you can tap into certain divinities or creative force centers in the world. Yantras are planned so that the eye is at the centre, and often symmetrical. 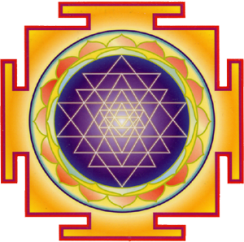 Yantra can be produced on paper, wood, metal, or earth, or they can be 3-dimensional.